Unfortunately for us it's a sad one today as we remember Mum's first true soulmate cat, Suzy, who passed away on June 29 1998. We are also sad today because just two days ago a very dear cat to us (my cousin Molly, who was Mum's brother's cat) passed away. We hope Suzy and Molly are now being looked after by my granddad Jimmy. Mum has shared some words about Suzy from one of her old diary entries. You can read them on her other blog here. For Caturday Art here is a photo of Mum and Suzy. Some of you may not know that Mum wrote a whole story inspired by Suzy called The Snowflake Pendant, which is available in both paperback and Kindle format from Amazon. 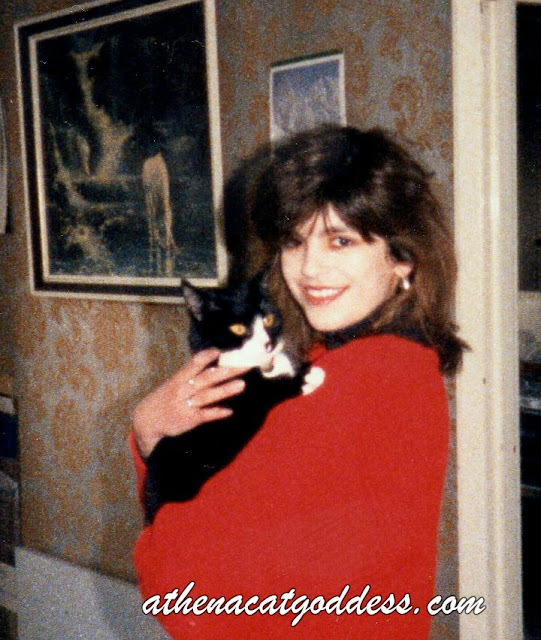 Mum's memoir The Cat Years: How My Cat Soulmates Saved Me also features Suzy, as well as myself! 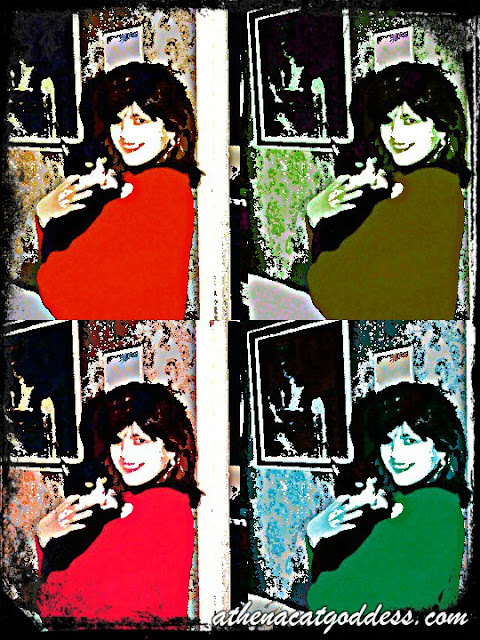 If you want to know more about Mum's books visit her Amazon Author Page. What a sweet photo of your human and Suzy. My human does not remember the exact day her soul cat died... I think she doesn't remember on purpose.. This art is a wonderful tribute to Suzy. We'll be thinking about you and your mom, Athena, as you remember Suzy and Molly. Suzy and your Mom look very happy together in the photo. It's a nice memory for your Mom to have today. What a lovely selfie of you and Suzy that is a very special memory we know and completely understand and we have read your books!!! That is a beautiful photo of your Mum and Suzy. I am sorry your Mum has a lot of sadness today, losing a beloved kitty is something you never forget. Sending a hug to your Mum. Thanks for innereducing me to Suzy. Tuxie's rock! Nice art. We know it's sad to lose a furry. Thankfully, they leave wonderful memories behind because we do miss them! How neat you have taken some of those memories to write books. We missed posting on Saturday so we could join this blog hop, so we posted today. Enjoyed your photos. Suzy looks like a nice kitty. Losing a furry friend is always so hard. (((hugs))) to your Mom. Thank you. Suzy was a sweet little cat. Yes, it is hard. And it so lovely to know other animal lovers out there understand that it's not just an animal. Animals are family! Oh, Athena, ee love this photo and memory of your mum and Suzy. Sending comforting purrs and prayers as Mum remembers Suzy and Molly. We are so sorry you were separated from Suzy and your bro from Molly. This hurts. A member of the family leaving is difficult and the hole left by them will never be filled. Our hearts are with you and your bro. What a lovely picture...it's obvious how special Suzy was to your Mum! Suzy was beautiful and its a lovely photograph of the two!